I’m ex cited to announce that my newest book is at the printer. 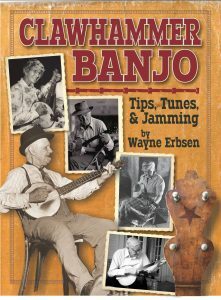 Entitled Clawhammer Banjo – Tunes, Tips and Jamming, the book was at least three years in the making, and I hope that people who want to learn to play in the clawhammer style on the banjo will think it’s a humdinger. Let’s take one of the tunes in the book for a test drive to see how she handles. “I Wish I Was a Mole in the Ground” in an appropriate tune for us to look at because it was the very first tune recorded on the banjo in a style that would eventually be known as old-time music. Playing banjo and singing on this song was Bascom Lamar Lunsford. Lunsford, who famously called himself “The Squire of South Turkey Creek,” was the first to record “I Wish I Was a Mole in the Ground” on March 15, 1924. 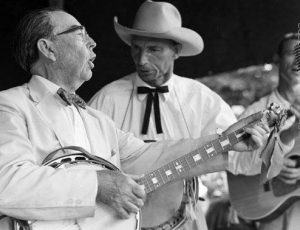 This recording marked the first time that anyone had recorded on the 5-string banjo in what would later be called country music. For that, we tip our hat to Mr. Lunsford. He later recalled that he learned the song from Fred Moody in 1901 when they were both students at Rutherford College. Lunsford insisted that the use of the word “bend” referred to a bend in the Pigeon River that runs through Haywood County. In 1952, Lunsford’s version of “I Wish I Was Mole In The Ground” was reissued in Harry Smith’s influential record set, “Anthology of American Folk Music.” It was from this record that the song became widely known among fans of old-time music. In the notes to this set of records, Smith disputes Lunsford’s claim about the meaning of the word “bend.” Smith suggests that the word was actually “pen,” and that it referred to Big Bend Penitentiary. Against my better judgment, I’m taking sides and sticking with Lunsford on this. Tuning: “I Wish I Was Mole In The Ground” is written out for you in what is called double C tuning: gCGCD (starting with the 5th string). Reading the tab: The first note of the tab is the 4th string played open. That’s what I call the “claw” of the clawhammer rhythm. Play that note with a downward stroke of your index finger. Then you’ll see an arrow and then the 5th string. That’s the “hammer” of the clawhammer stroke. Merely brush down on the first, second and third strings with the ring and middle fingers of your right hand. The rhythm of the clawhammer lick should sound like the syllables of the word “clawhammer:” claw-ham-mer. Hot Lick #1: A great way to decorate “Mole in the Ground” is to use slides. Any time you see the 4th string at the 4th fret, you can slide into it. Simply fret the 4th string, 2nd fret, and slide up to the 4th fret. Hot Lick #2: At the beginning of measures 5 and 9, the melody goes up to the 1st string, 2nd fret followed by a “ham-mer.” This would be a perfect place to add a hammer-on. All you do is play the 1st string open, then quickly hammer down on the 1st string, 2nd fret. 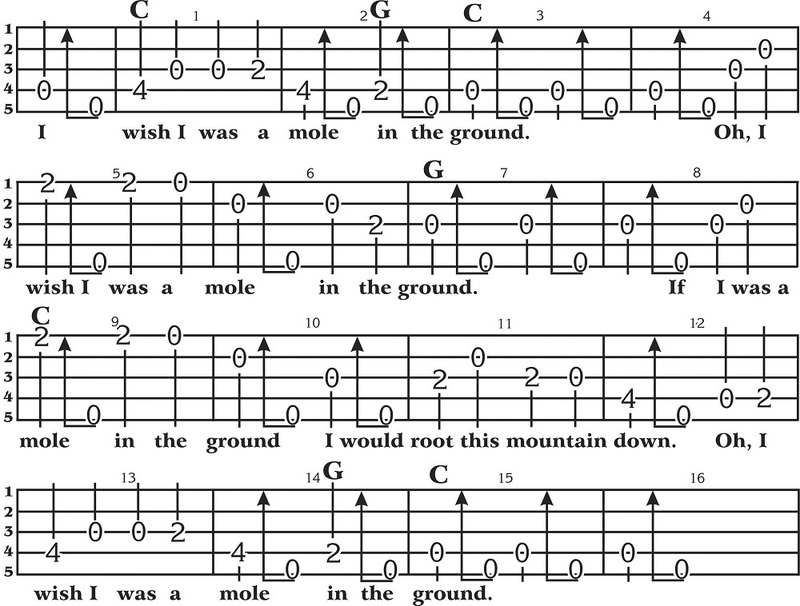 Fudging the Chords: In measures 2 and 14, “Mole in the Ground” goes quickly to a G chord and then back to the C. It’s certainly difficult to get to the G chord fast enough. When I play it, I often fudge and skip the G chord entirely. All I do is play the open strings on the “ham-mer.” Feel free to do this same thing. But for goodness sake, don’t tell anybody you’re doing this. Let’s just make it our little secret. OK? 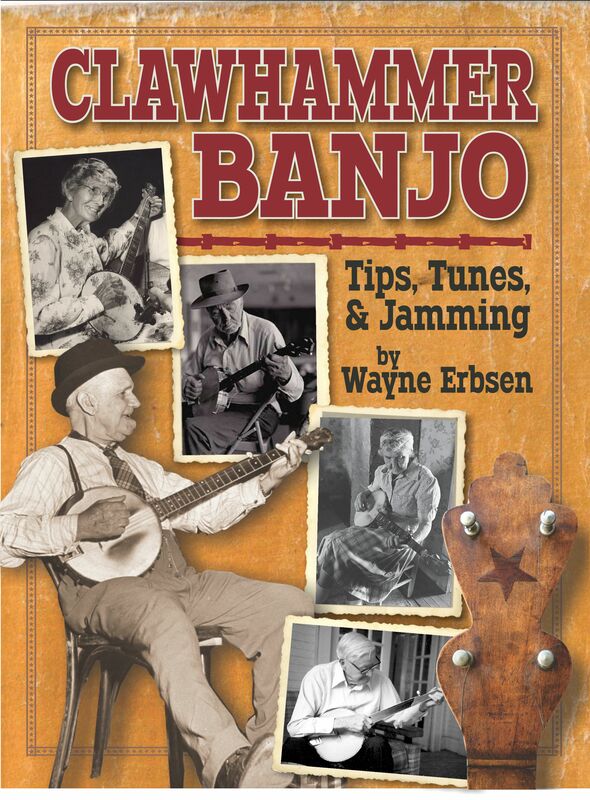 Clawhammer Banjo – Tunes, Tips and Jamming will be available Thanksgiving week 2015. You can pre-order this book now by calling 800-752-2656 and receive a 15% discount for reserving your copy! ← Ukulele Advice: Do I need a strap? How do I hold this thing?